While a map makes it an easy to interpret complex geographical information, the software and data required to produce this user friendly output can be expensive and technically challenging. That is why many organisations choose to outsource their specialist mapping requirements. Spectrum offers specialist GIS consultancy and can produce the required outputs in either hardcopy (up to A0 Wall Map size), electronic or web based format. Should customers wish to undertake their own analysis in house (without the expense of employing specialist GIS professionals), Spectrum can assist with the development of user friendly electronic mapping interfaces including web based solutions. Spectrum has just secured our second client who needs a web based mapping system world-wide to show their territories and locations. Using a combination of Mango Maps and aligning the data using our Pitney-Bowes MapInfo GIS, we can basically cover the world. If you do have some offshore business, this is a great way to have a standard set of territory maps and be able to see your own sites, basic demographics and your competitors. Mango Maps allows you to send a link for a specific territory of interest to a potential franchisee, without having to show your whole network plans. So far we have provided the service in 31 different countries, and naturally we can also use it to see your Australian and New Zealand stores and territories. Please give us a call if you would like to discuss. Where do our customers/members come from? Membership density (members / 1,000 persons) at certain radius or postcode. Which customers use which store? Similarity between leads generated and sales actually concluded. 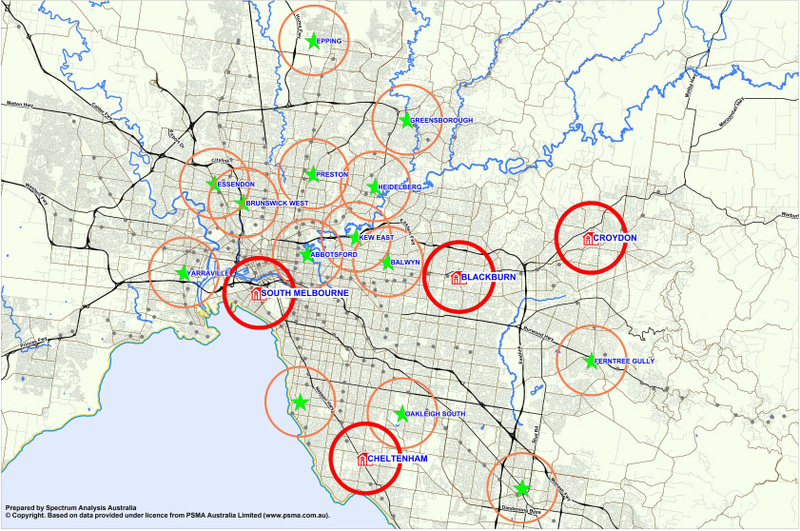 An AFL football club recently had us geocode their membership base to learn where they had the best penetration, and how they fitted their sponsor's target catchments. The Geocoding is produced by using the Map Marker tool, where given the correct address and Postcode, any site can be marked on an Australian Map. Seeing the bigger picture on a map can also assist in business leaflet drops, Cold calling or other forms of marketing and advertising. To view our detailed brochure on using these services for the Hotel, Club & Gaming industries, please follow the link to download. Through Google Earth and Google Maps, most of us are now very familiar with satellite views overlayed onto maps. These applications are often the first port of call for geographic questions like how to get from A to B, or where a given suburb is in relation to another landmark. Spectrum Analysis specialise in information-rich mapping such as store networks, customer distributions, and territory plans. Historically, we have delivered this geographic information in static formats like PDFs and image files, but now we have the ability to cross-link with the interactive capabilities of Google Earth. We are pleased to be able to offer this functionality as a supplement or an alternative to the traditional delivery formats. Ability to Navigate – Zoom out to get perspective, zoom in to get detail, or ‘walk’ around the map to see where your store or territory is positioned in relation to major attractions and your customer base. Interactivity – Your maps will have all the functionality of Google Earth, just with your stores or territories added on top. So you can add or remove the satellite picture, the road labels, major landmarks, and so on. Compare that with a static PDF, and you will recognise the value of this approach. Lead Allocation – If you have a call centre that distributes the leads that come in from a 13 or 1800 number, then these maps could become the cornerstone of the lead allocation process. The operator would simply type the address of the caller into Google Earth, and it would instantly show which territory that lead is coming from, or which store it is nearest. The days of dividing territories based upon populations (or even the dreaded “black texta on laminated wall map” approach) are thankfully over. Spectrum Analysis has developed a superior, foolproof method of Territory Planning and Sales Area Mapping for carving up an area into equitable territories, whilst taking into account the industry type and target market. This ensures that resultant territories offer equitable sales or profit potential. Territories can be presented as aggregate Postcodes for ease of administration and marketing, or even telephone exchange areas in the case of 13 call numbers diversion. - however you would like to do it, Spectrum's Territory Planning process will complete the picture. Over the years, Spectrum has assisted many clients in strategic sales area mapping, guiding them to set up territories and making them of similar potential for Franchisees. In many cases, when asked for individual datapaks or maps, we had to prepare these on an individual, ad-hoc basis. We have recently focused our efforts into a new sales area mapping program that allows us to produce individual territory maps in a far more cost effective manner. Not to mention the considerable reduction in the time that it now takes to produce a map, which frees us up and allows us to perform other tasks. The maps will be delivered as a PDF map as sample. Spectrum has devised a method of combining several characteristics of a target group into a single index score used for comparison of area potential. Interactive store maps is a way to present store specific information through a point and click mapping interface. A range of information like store fact sheet, location map, area demographic summary, area business and employment summary, business hit list and store photographs can be linked to the interactive store map. This helps a user navigate through a myriad of useful information with relative ease. Store summary sheet detailing some quick reference facts about the store like sales figures, sales ranking, property details (for example, lease expiry and rent), store characteristics (for example, trading hours, number of counters, signage and floorspace ), market characteristics (for example, population density and relevant businesses in the area), generator information (for example, the shopping centres in the area) and competitor information. Photographs of the store capturing some key criteria's that are considered relevant to sales, this may include signage visibility, onsite parking, reception area and general presentation of the store. Once the information pack for the entire network is compiled, it can be linked to the respective stores on the map and the user can access this information just by pointing and clicking on any store on the network overview map. Click on the territories to view associated information pack. Spectrum has moved forward with technology, and are now able to deliver reports in HTML format on discs (CD’s or DVD’s). HTML is a computer programming language, which among other things, enables a user to point and click on text and objects, and navigate through a myriad of information with relative ease. Once your Territory Planning is complete, you can have easy access to your individual maps and data. 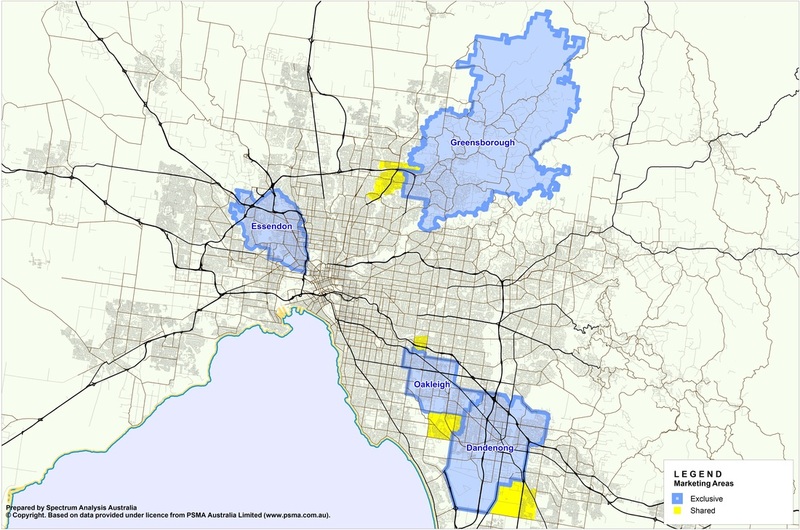 Locator map showing the location of your store or trade boundary, the residential density of population, the location of local businesses and community groups as well as the location of retail hubs and shopping centres. For an additional charge, competitor location can also be included in the map. Once the data pack for the entire network is ready, it can be linked to the respective territories on the map and the user can access this information just by pointing and clicking on any territory on the territory overview map.